B2B communications can be difficult. The juxtaposition of writing as a person and coming across as a company can be difficult to balance and is not often achieved by many companies. However, without the human touch, people find it hard to interact as the whole process feels robotic. I have said previously that the more human your brand, the further you will go. Create relationships, collaborate, be honest and if you make mistakes, own them and learn from them. This is especially true on social media. It is the perfect platform to give some personality to your brand and really build a connection with your audience. Building trust and forging relationships is usually something that happens behind closed doors, but social media allows this to happen publicly where the world and future customers can see. Therefore, make sure that your presence on social reflects your values and work ethic as these public forums are effectively shop windows through which all can see. 2. Be in the right place, at the right time. I have spoken about serving the right content to the right people numerous times in relation to their customer journey, but how does this work with social media? Well it’s the same sort of concept. The main rule here is knowing your audience, knowing your company and knowing the general user demographics of each social platform. 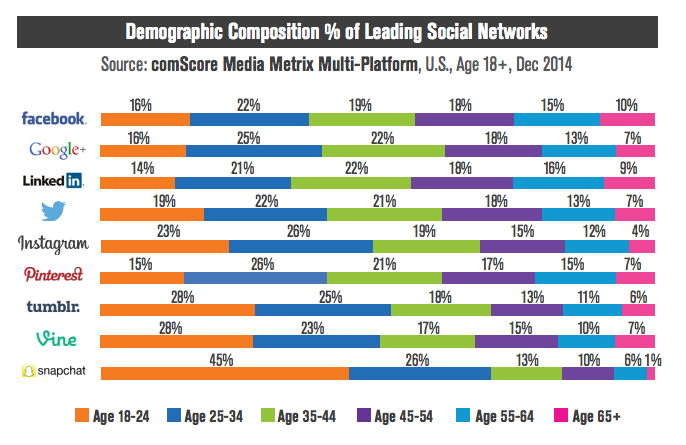 Research from ComScore identified the demographic composition percentage of the leading social networks and in all honesty, it is far from surprising. Over 35 year olds are far less likely to use snapchat than millennials, but are far more likely to have a presence on LinkedIn, Pinterest and Facebook. The industry type must also be taken in to account, as high value enterprise products which require substantial investment will not be suitable for certain platforms. For example, serving marketing for an Enterprise Resource Planning System on snapchat will probably be a wasted effort. In 2018, Hubspot identified that LinkedIn in 277% more effective in generating leads than Facebook. As a result of this, companies who know their audiences are active on LinkedIn should be formulating their content strategy to include social outreach on this platform, generating great, sharable content which will build awareness of their brand and in turn generate leads. This brings me on to point three. Your content strategy should play a large role in your social media presence. Companies who are posting willy nilly with no overall strategy will not achieve any sort of success. Social media objectives should not just be about achieving leads, it should initially be about building brand presence and awareness. You are often nurturing customers throughout their journey so your social content must be educational and relevant to the rest of your communications. Knowing when to post is also key and must fall within your content plan. Having a comms plan which has pre-planned, scheduled content will make your social media campaigns more successful. SproutSocial posted a great article on the best times to post on social media, so use this insight formulate a consistent regime! Very few customers are going to buy your product via twitter…but what they will do is engage with your brand and in turn visit your website. Therefore, ensuring that your profile gives a realistic snapshot of what you do and a link to your website will help that process. But what about those indirect traffic opportunities? We spend a lot of time optimising our web content for search engines, but often don’t think about our social content. However, social media content is now indexed by search engines, so it is important to make sure every piece of published content is optimised for search engines, whether this be a blog, web page, tweet or LinkedIn update. Keep your keywords handy! Paid social can have a huge impact on a company’s marketing efforts. However, those who are struggling to make their organic social work are often deterred from putting budget behind their efforts. 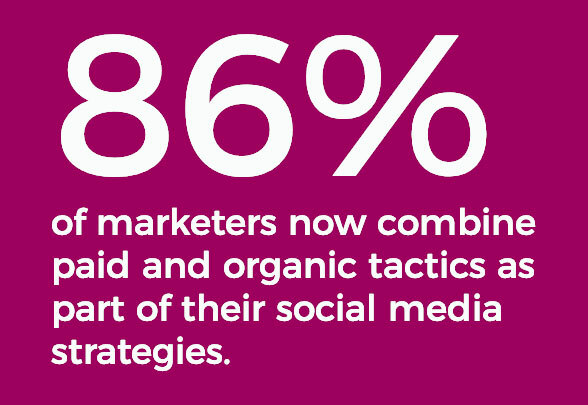 This is not always the right plan as demonstrated by the 59% of marketers who believe paid social is more effective than organic social. However, in order to drive measurable, qualified leads you need a paid traffic strategy. This is no easy feat and involves defining personas, establishing goals, creating KPIs, choosing the right platform and ad type, creating killer content, targeting your ads and finally analysing and optimising throughout. A stretch too far, for many marketing teams. Luckily, it is not a stretch too far for us. Sherpa run paid traffic campaigns for our clients daily and know the ins and outs. In fact, our paid traffic services became so popular we employed a paid traffic specialist. Just one of the ways we are helping our clients generate leads. Social media can be such a great asset to your marketing campaigns, if done correctly. So, stick to the 5 rules above as a bare minimum and you will be on your way to social success. And whilst you're there, why not give us a follow?